So much yarn, so little time. : Life without blogger? Goodness me it was stressy yesterday when blogger spontaneously exploded. 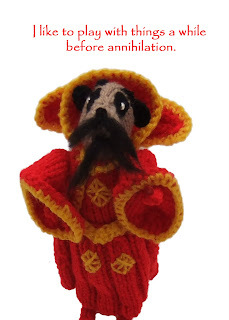 Personally I think it was because my last post (which vanished for a day) featured Ming the Merciless Meerkat. Maybe blogger's meltdown was the beginning of the annihilation of the Earth? If you were one of the many joining the panic on twitter or facebook, I recommend making sure you are following their updates! I'm going to be giving my blog a facelift over the next week or two, it's high time I used more of the available features. If you have any suggestions, I'd love to hear from you! So far all I've done is switch to 3 columns (and one of those is empty as yet!) but I'm planning on getting more organised, creating more pages so my shop contact details are more accessible and generally decluttering. I *might* separate out the blog posts into categories, but I'm not sure how easy that would be or even if it's worthwhile. I enjoy posting randomly, mostly because I don't usually enjoy reading blogs that are *only* about the particular blogger's craft and shop. I like to feel I'm getting to know someone through their blog - and I hope you do too! What a palaver yesterday... It all went Pear...I was in tears at one point! Aha, so it's your fault! Yes, was a panicky couple of days, wasn't it? I just had a blog redesign which I am happy with, but I've fallen out with the 'pages' function a bit because I have to create dedicated content on my blog and I wanted to point it at my website. I'll be interested to see what you come up with. So it was your fault all along, Nifty, and there was me thinking I'd done the damage by uploading too many pics. Yeah, I spent a long time drafting and then publishing a post promiting Zibbet on Wed. Only to find my post had disappeared. It was very stressful. Geez,what would we do if the entire internet one day disappeared? Welll.....glad we know who's at fault. Blogger down time was so amazingly annoying, especially since I had an entry disappear along with its comments (though I did manage to restore it eventually, using a link from a feedburner email a friend sent me). It was quite stressful to be without blogger. Posts vanished and returned and vanished again. I had stuff to say and had to wait it out, hoping that everything I've written and shared wouldn't be lost forever. funny birds - or a car wash? We're on an album cover! Toast and otters - what's not to love? Ooooh we got another parcel!